This bottle is a very rare example of Chinese flashed glass, where a thin layer of color is added to the colorless glass, giving the impression that the entire ground is monochrome pink. 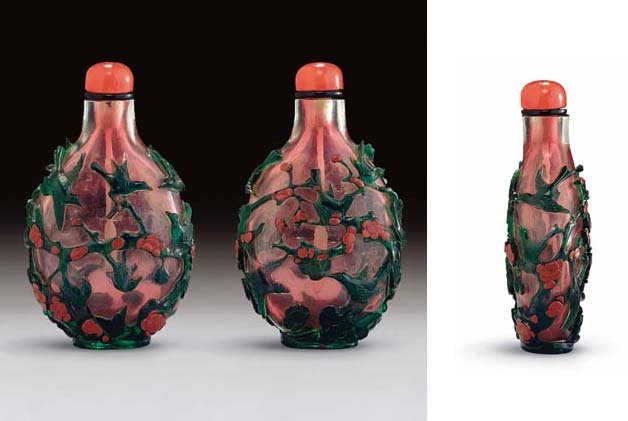 See Christie's, Hong Kong, 1 November 1994, lot 1215 for another example of a flashed reddish-pink glass snuff bottle. This rarely-used technique was usually confined to monochrome wares, nearly always of ruby-red color. It is extremely rare to find it as the ground for a cameo overlay carving, and its combination with this rare double overlay with cinnabar-red on green appears to be unique. This combination of opaque cinnabar-red and transparent green as a double overlay is found on snuff bottles attributed to the Li Junting school in the mid-Qing period (see Moss, Graham, Tsang, A Treasury of Chinese Snuff Bottles, Vol. 5, Glass, nos. 1012-4 for Li-school bottles, where nos. 1012-4 and 1017 have red-on-green overlay on various colored grounds). The prunus and bird motif was also popular in the late Qianlong period; for two examples on a yellow ground, see M. Hughes, The Blair Bequest. Chinese Snuff Bottles from the Princeton University Art Museum, pp. 124-5, nos. 144 and 146. Another example with red overlay on a bubble-suffused ground is illustrated by Moss, Graham, Tsang, op. cit., no. 896. Magpies and prunus form a rebus for happiness, and when twelve magpies are shown, it is a wish for happiness during all twelve months of the year.